This necklace is 38.5 inches long (99.06cm). It is beautiful and eye-catching. If you love the look of natural gems and pearls, you will love this necklace. I created this necklace with nine 8mm green aventurine, twelve 4mm misc. shape green aventurine, thirteen 6mm round and bicone Swarovski crystals, twenty-four 4mm rondelle and bicone Swarovski crystals and ninety-six freshwater pearls in various shapes and colors. 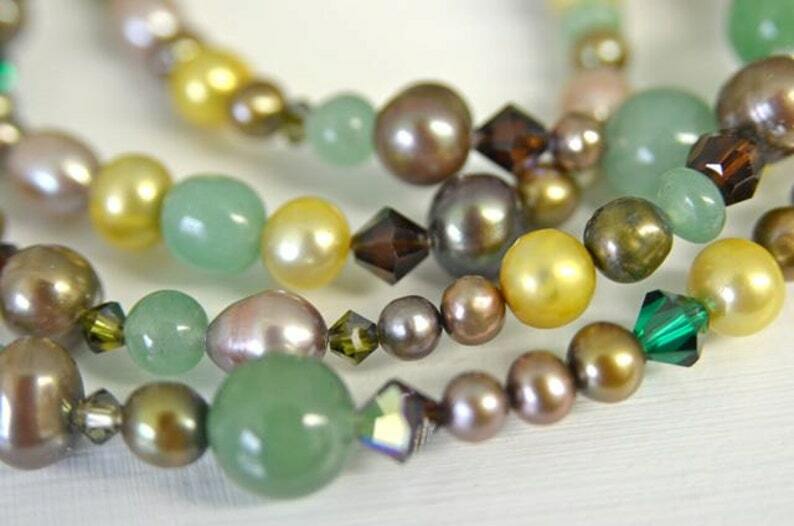 The freshwater pearls range in size from 4mm to 8mm. There is a lead free pewter toggle to complete the piece. If you want a necklace that has a big personality, this is the one for you! All of my jewels are created to last a lifetime. Thank you for looking. Please contact me with questions. Long Pink Pearl Necklace with Fruit Punch, Light Pink, Mauve, Salmon & Blush Freshwater Pearls . Handmade in Maine "Everything's Rosy"
What a great seller and what a great necklace! I just adore it! It is so beautiful and well made. Thank you Kimberly for an all round great experience. Your work is amazing! If I have grossly misrepresented an item, of course your money will be refunded....if there is some other problem, let's discuss it and we can come up with a solution together. If you have return authorization, the jewelry must be shipped in the packing materials and boxes that you received them in. I am not responsible if I receive a damaged return that was not packaged properly...this can totally be avoided with proper communication. I pride myself on that aspect of our transaction. I want you, my customer, to be happy and satisfied!!!!! SHIPPING INCREASES HAVE TAKEN EFFECT...2016 USPS postal increases....The shipping price is comprised of a small flat rate PRIORITY box from USPS with delivery confirmation. The flat rate price is $6.10 with delivery confirmation. Items can not be shipped, until payment is received. ***A note for international shipping: the buyer is responsible for all customs fees, duties and import charges that may occur at the time of delivery. You, the buyer, should know what the rules of your country are. If you would like an additional item, to match something that you are purchasing...please contact me. I am happy to make matching earrings, necklace or bracelet if you would like to have a set. In most cases this will be a very easy process because I try to save stones, just for this reason. However, please take note, that there is a chance that I may no longer have some of the materials to make an exact match. I will do my very best to try and honor any request you may have. If you see an item that I have created, and you like the design...I am happy to create another piece by changing the natural stones or colors of the piece of jewelry. Please contact me so we can discuss the options! I LOVE working with people to create personal, unique pieces of jewelry.